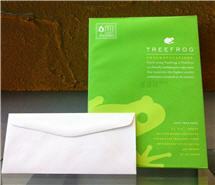 TreeFrog by National paper used for environmentally friendly and sustainable envelopes has absolutely no wood or wood fibers used in the manufacturing process. Instead, the paper is made from a 100 percent sugar cane byproduct called bagasse. Additionally, no sugar cane is harvested specifically to produce this paper. The by-product is diverted from land filling or burning, making it a truly eco-friendly option. Sugar cane can be harvested twice a year, making it a renewable paper source.